Caption slip reads: "Photographer: Gaze. Date: 1952-05-30. Reporter: Gaze. Assignment: Dory Race winners. 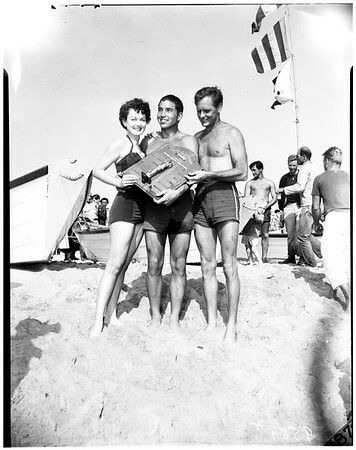 #87: L to R: Joy Mustizer, UCLA student and Miss Santa Monica of 1952 presents trophy to John Howe and Lieutenant Fred Bleecker of Santa Monica Municipal Lifeguard service, winners of 10-mile dory race from Malibu to Ocean Park today (Memorial Day). #88: L to R: John Howe, 27, and Lieutenant Fred Bleecker, 38, of Santa Monica Municipal Lifeguard service, with Joy Mustizer, 20, Miss Santa Monica of 1952. The two lifeguards won the gruelling, 10-mile dory race today (Memorial Day) from Malibu to Ocean Park. The trophy was presented to them by Miss Santa Monica who will compete in the Miss California contest this summer at Santa Cruz".